In development for over two years, the new desiccant product contains a more aggressive sorbent with much greater moisture-adsorbing capacity, packaged in an attractive, molded, disposable container. 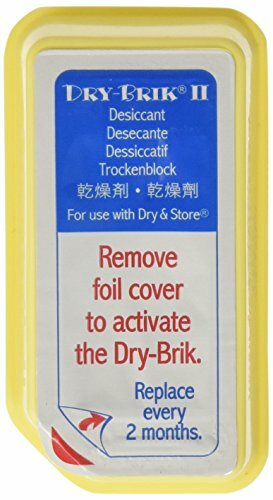 Dry-Brik II works with all Dry & Store models. 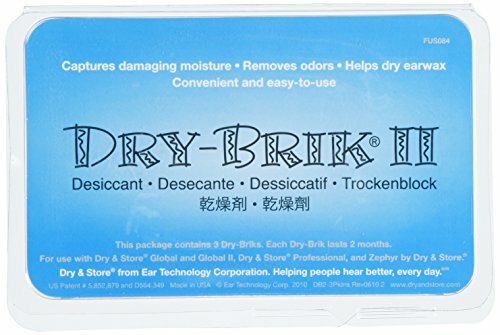 Product Information The Dry-Brik contained in the Dry & Store family of products has three important functions: (1) to permanently remove the moisture molecules that are released from the devices during the warm drying cycle; (2) to drive the relative humidity inside the box to a much lower level than is possible with just a heater, thus maximizing the drying capability; and (3) to capture odors. Boxes using heat alone lower the relative humidity by warming the air, but the amount of moisture in the air does not change. While warm air can hold more moisture than cool air, unless the water is removed, it can condense right back where it was when the heat goes off. That's where the desiccant comes in. Products without a desiccant might work fine in a desert, but in a humid environment they are simply ineffective. 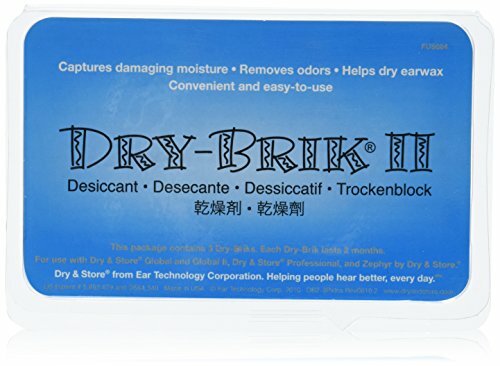 The Dry & Store family of products uses Dry-MaxTM technology: a controlled amount of warm dry air, a soft but continuous flow of air around all of the small ports and openings in an electronic device like a hearing instrument, and the powerful Dry-Brik II desiccant to do the job right! 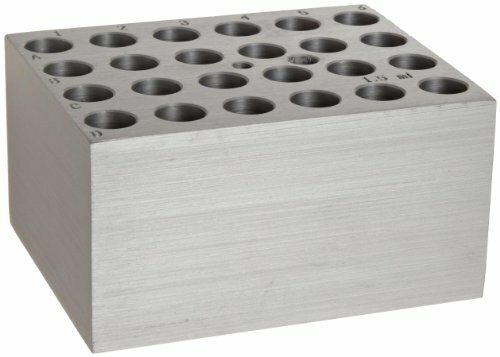 Block holds twenty-four 1.5ml centrifuge tubes for Benchmark Digital Dry Bath (BSH1001, BSH1002, BSH1004). Block cavities are precision machined to match the conical shape of the tube size, providing unsurpassed temperature uniformity. Block size: 3 x 3.75 x 2 inches (7.6 x 9.5 x 5cm). Capacity: 24 centrifuge tubes. Tube size: 1.5ml. Material: high grade aluminum. Sold individually. Benchmark Scientific #: BMK-BSW1500. 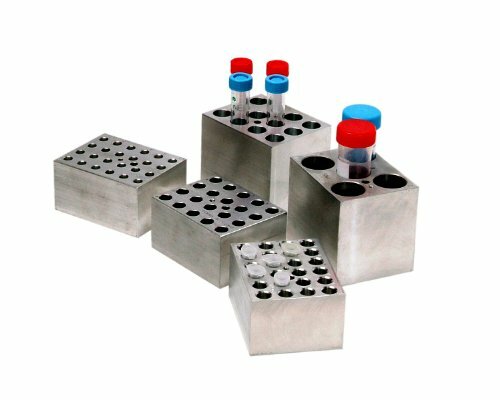 Block holds five 50ml centrifuge tubes for Benchmark Digital Dry Bath (BSH1001, BSH1002, BSH1004). 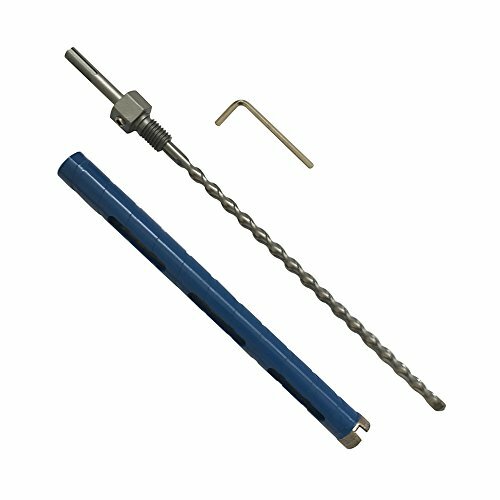 Block cavities are precision machined to match the conical shape of the tube size, providing unsurpassed temperature uniformity. Block size: 3 x 3.75 x 3.25 inches (7.6 x 9.5 x 8.2cm). Capacity: 5 centrifuge tubes. Tube size: 50ml. Material: high grade aluminum. Sold individually. Benchmark Scientific #: BSW50. 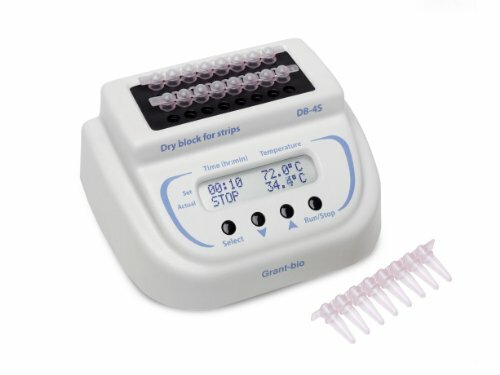 The DB-4S designed for maintaining constant temperature of samples in tube strips. Aluminum dry block offers excellent stability and uniformity. The 2-line LCD screen clearly displays the actual and set time and temperatures, simple to push buttons allow easy setup. The timer with an audible alarm alerts when attention is required. 21"-25 "Professional Poly Black Mannequin Block Head Wig Display Style Dry With Mount Hole 21" Height 12"
Product Description1.Fulled with Poly urethane.Poly Inside Canvas Block Head, which can be Washed ( Cork Inside Head Can not be Washed).2.Poly is not Styrofoam. Poly is more DURABLE than Styrofoam.Unlike flimsy styrofoam heads, this quality wig head won't flake when pins are inserted.3.Canvas block head with mount hole ,do not need specific stand with clamp and the diameter is 1 inch.4.Our measurement is showed as picture.Using a soft measuring tape,measure around the crown-the largest diameter around your head.Start approx 2cm above your eyebrows.keeping the tape above your ears,and around the back of your head at the largest point.5.High quality canvas block head for holding wigs for hours at a time while washing, styling, or putting on display.6.Is your wig long, short, or mid length? Straight, curly, or wavy? Bouncy or flat? No matter what, this wig head is for you. 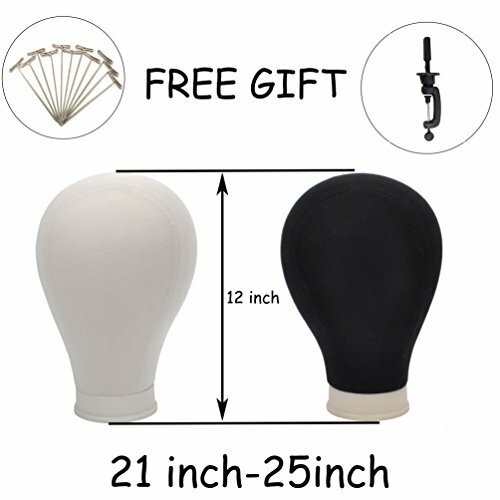 7.You can return the item free shipping,if it is unsuited.Top-Rated Canvas Block Head in the market. Purchase with confidence, free feel to check out adorable reviews. Nobody wants to worry about heavier bladder leaks and surge incontinence. New Poise Ultimate Extra Coverage Incontinence Pads are our most absorbent pad, giving you the confidence and protection you need, day or night. This overnight pad provides more coverage and wider protection than any light bladder leak pad (as compared to other branded LBL pads). The NEW Secure Sleep shape features a 75% wider back (compared to Poise Ultimate Regular Pads) for extra protection while lying down, while the Absorb-Lock core quickly absorbs and locks away wetness and odor. Leak-Block sides give you discreet and worry-free incontinence protection, and the Dry-Touch layer helps provide comfort. This package contains individually wrapped Poise Overnight Incontinence Pads with extra coverage. Poise products are FSA-eligible - only applicable in the US. Poise is the number-one brand for bladder leaks based on Nielsen Market Share Data. 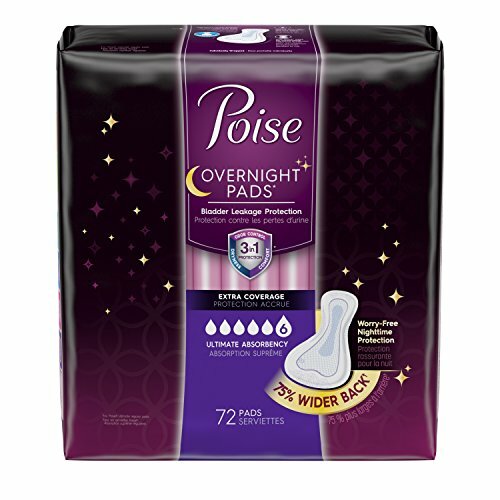 Save up to 15% with Subscribe & Save, and be confident you always have Poise Overnight Incontinence Pads on hand. 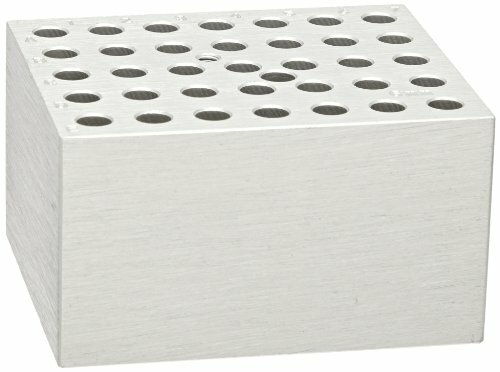 Compare prices on Dry Block at ShopPlanetUp.com – use promo codes and coupons for best offers and deals. We work hard to get you amazing deals and collect all available offers online and represent it in one place for the customers. Now our visitors can leverage benefits of big brands and heavy discounts available for that day and for famous brands.